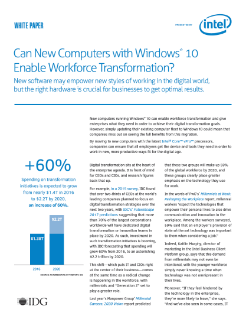 Enable Windows* 10 workforce mobility by selecting hardware designed to deliver performance, stability, security, and manageability. Get the most from Windows* 10 with new form factors, faster multitasking, long battery life, and enhanced security. Learn how a new generation of computers is needed for the new “OS-as-a-service” model to fire on all cylinders.